One thing many of the folks hereabout have in common, is a desire to work together whenever the opportunity presents itself. This page will explore how they do that and introduce you to the some of the wonderful projects and organisations this town has to offer. If you are a Glastonbury Community Organisation and would like to be included here, do get in touch. There is no charge but donations are always welcomed in support of our services. In 1885 Glastonbury solicitor, J. G. L. Bulleid, was mayor for the sixth time and he proposed that a museum should be inaugurated during his year of office. He was an energetic Victorian with immense knowledge of the town and its past. The market space under the Town Hall arches was enclosed and with J. G. L. Bulleid as the first President, the Glastonbury Antiquarian Society was formed. The Glastonbury Antiquarian Society has an extensive site, with archives and pictures of the town and its features, including a town trail and the Lake Village. 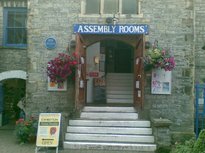 The Assembly Rooms, a Community Arts Centre has a rich history that has included productions by the great British composer Rutland Boughton and being home to the first Glastonbury Rural Arts Festival which featured such luminaries as George Bernard Shaw, Alice Buckton, Thomas Hardy and T.E. Lawrence. Run by the community, for the community with an open outlook and non discriminatory by nature, they promote spiritual, artistic, educational, and cultural activities, encouraging people of all faiths and spiritual paths to use the facilities for meetings, meditations and celebrations. Here the many strands of our different spiritual paths and ways of living can meet and continue to inspire. The Avalonian Free State Choir is an unaccompanied natural voice choir with a repertoire of songs from all around the world. The thrill of listening to them comes from clear bright harmonies that are uplifting to the soul. The choir was originally founded in 1992 to sing traditional and contemporary English folk songs and carols, but by 2004 had widened both their repertoire and the range of venues at which they sing. The choir is run as a collective and is merit based. The choir has a reputation for a unique and varied repertoire, stunning tunes and a high standard of a capella singing. Bridie's Yard is a not-for-profit, Glastonbury based local organic food co-operative run by a team of volunteers with a mission to provide affordable organic food for everyone. You can get together with friends and bulk order basic foods, or browse the latest food catalogue for your own favourite foods. They are open to selling a local surplus of organic veg if you grow your own, and seasonal foods such as cordials, jams and treats. Glastonbury Conservation Society was founded in 1971 in appreciation of Glastonbury's built and natural environment and not only have they been responsible for saving Glastonbury's built heritage but the society has so far planted 47,200 trees in and around Glastonbury. Find our more. . .
Glastonbury FM (GFM) is the Community Radio Station for Glastonbury, Street, Wells and all the surrounding villages. GFM is a service different to any currently available in the region, with it’s entire output sourced locally. It’s radio made by local people for local people. Throughout their 5 year licence term, they intend to continue building the diversity and range of output, bringing more and more local people to the airwaves. As a not for profit organisation, and without the restriction of a commercial mandate, they are confident they can challenge, educate, inform and include all parts of the community. Tune in to Glastonbury FM here...! in the town that gave its name to a festival. No where else on the planet could a small rural community (pop. less than 10,000) band together and paint their town turquoise, producing a celebration of arts and music, featuring as many as fifteen wildly different events every day, for a full eleven days, in thirty different venues. What other small rural town even has thirty different venues? The Isle of Avalon Foundation began life in 1991 as The University of Avalon, with the original vision to re-establish Glastonbury as a great centre of sacred learning. In 1995 it changed its name to The Isle of Avalon Foundation. The Library of Avalon is, to its Trustees' knowledge, the only publicly-accessible esoteric library in the UK, perhaps even in Europe. A public reading-room is provided for the use of non-members, with full reference access to the displayed collections. All visitors are welcome. The opening hours include all weekday afternoons. The Library's collections include, among about ten thousand books on display and several thousand more currently in storage, elements of the libraries of the Research into Lost Knowledge Organisation (RILKO) and the Wessex Research Group. We have over 40 members and we are keen to welcome new voices. With a super mix of personalities, the choir is a great way of making new friends. We socialise together after rehearsals and have a lot of fun at choir social events.We find singing as a choir uplifting and rewarding, but ultimately, we sing for the joy of it. We don’t have amazing voices, but as a group, we come together to deliver some wonderful, hair-raising harmonies; we even amaze ourselves with the sound we can create! We welcome you to come along and sing with us and see how you like it. There are no auditions to endure; we will partner you with someone to 'show you the ropes' and help you find your place in the choir. Our repertoire is always growing and changing. We sing an expansive range of genres including modern, traditional, folk, pop and sacred, with a few well-known numbers from popular musicals. During the Christmas period, we have a selection of festive music to get you in the spirit of things. Glastonbury Online is a website devoted to providing Glastonbury information to visitors and resident alike. A not for profit company assisting the development of internet use amongst Glastonbury businesses, community groups & people. Any profits generated are put back into supporting the development of community webpages/websites for local organisations. Glastonbury Online was formed out of a loose collection of local webworkers and are proud of their good relationships with other webworkers in the town and continue to promote co-operation rather than competition in the community. Glastonbury Opportunities provide a friendly, free service for local people seeking to find a productive or creative role whether through employment or self-employment, training or volunteering and can look for information about funding opportunities related to these and for community groups. Volunteer advisors are professionally qualified or are training and under the supervision of a professionally qualified volunteer advisor. Credit Unions enable people in a community to come together to save ethically and to borrow money at competitive rates. Mendip CU is a mutual organisation – this means that there are no external share-holders and any surplus is paid out at the end of each year as a dividend to its members. Members’ savings are safe in a credit union – 100% of your savings are covered by a government guarantee scheme. Like all other credit unions, MCCU is authorised by the Prudential Regulation Authority and regulated by the Financial Conduct Authority and the Prudential Regulation Authority. MCCU is run entirely by volunteers, who take a real pride in going the extra mile to provide a fantastic service. Their members can take a real ‘hands on’ interest in running the credit union – and it keeps the running costs low! The Red Brick Building Centre is an industrial building , previously a sheepskin tannery and factory that fell into disuse. Saved from demolition in 2008 by concerned local young people who had a vision for its future, a group of local people have met regularly to plan the transformation of the building into a dynamic enterprise and community hub that responds to local needs and opportunities. Somerset Community Food, based in Glastonbury, is a grass-roots charity which aims to re-connect people with the social, health and environmental effects of growing, buying, preparing and eating local food. Currently, their main project, Somerset Land and Food, aims to bring more land into production for community based growing projects. Demand for land exceeds supply in many parts of Somerset so this project seeks to match landowners with available land with local community groups interested in growing food. It will also help people develop the range of skills and gain access to the tools that will enable many more people to eat affordable, locally grown and healthy food. The organisation also runs Get, Set, Grow and Get, Set, Cook courses across Somerset. Thirteen women from Glastonbury have come together to tell you how they have lived. Each one of them have very different histories - a millionaire lifestyle, a New Age Traveller, a struggling single mum, a feminist peace protester in 70's New York, a resting actress, a teacher, an alcoholic and an advertising executive. No matter their backgrounds though, they have all ended up in this small Somerset town sometimes referred to as ‘the Heart Chakra of the planet’. Raw, authentic, beautiful, inspiring, they bring you their struggles and hard-won wisdom. Transition Resource, based at the Red Brick Building, supports Re-Use and Upcycling projects with the intention to turn rubbish into a resource by creating value from it. They do this by designing products or services around "stuff" that may otherwise end up in landfill. Those products then generate money to support the same creative people making more good! In doing this, the organisation serves as an educational stepping stone towards helping people realise there is no need to be a throw away society and introduce the possibilities of a new circular economy. 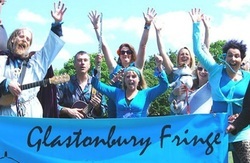 The Glastonbury Trust is a charity that works with individuals and community groups to promote emotional well-being, citizenship, environmental improvement and spiritual growth and support projects which have community cohesion and inclusion at their heart. Over the years the charity has funded both ecological and spiritually oriented projects in the Glastonbury area, including sustainable housing, organic horticulture and spiritual development. VN is a charity organisation based across Somerset, with their head office in Glastonbury. It has been up and running since 1999, with many changes along the way to suit the needs of the young people they work with, their communities and ever changing lifestyles. They work with volunteers and organisations to help place suitable volunteers with great placements and vice versa and support them throughout their activities as well as putting on volunteering taster days. They run a number of projects with the main aim being to assist volunteers aged 16-25, although they do work with all age ranges. They work with a large number of organisations involved in all aspects of volunteering. and can also help young people obtain the well deserved accreditation, with the use of their v awards which range from a vThank You certificate right through to a vImpact award, acknowledging community benefits from a young person’s positive action. 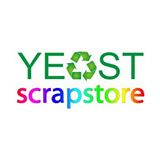 YEAST Scrapstore is a fantasmagorical treasure trove of crazy creative play materials bursting out of their premises at Unit 7 Dyehouse Lane, Glastonbury. They are passionate about helping individuals, schools, play groups, church groups, and their leaders have arty fun by supplying cost effective, exciting craft materials, as well as advice, work-sheets and workshops. They are a community based charity, who collect local business waste (which is safe for re-use and otherwise destined for landfill) and sell it to members for a fractions of what you’d pay on the high street. Whilst they have a Christian focus, everyone is welcome.